Nearly 30 different species of dahlias exist, all native to the highlands or montane regions of Central America. Modern dahlias that are grown by gardeners are the result of complex hybridization of a selection of ornate, variably shaped, sized and colored flowers. For all practical discussion, dahlia flowers come in all shades and blends of all colors except blue, black and green. There are even bronze and brown-colored flowers, resulting from dark red or dark orange pigmentation. Light to dark golden shades of yellow flowers can be selected from the hundreds of varieties (cultivars) of dahlias. Pale yellow blossoms are seen on cultivars "Alva's Supreme," "B.J. Beauty" and "Horse Feathers," and more canary-yellow or bold yellow petals are found on "Charlie Two," "Windhaven Blush," "Vicki," "Ruskin Diane,", "Embrace," "Hamari Accord" and "Honka." Pure white petals can be found on many dahlias. Sometimes they may be described as "creamy" in color, which suggests a pale buttery yellow hue. Examples of dahlias with pure white coloration include "Juul's Lotus," "Karris 150," "Nina Chester" and "Verda." Some varieties may have the faintest hints of lavender or pink but fail to reveal these blushes if not grown in intense sunlight, such as with "Trelyn Kiwi." Red can be subjective, as other descriptors like scarlet, orange-red, cerise or magenta can muddy precisely what a red dahlia looks like. Dark red dahlias like "Aurora's Kiss" or "Moorplace" may border on maroon or burgundy (perhaps even red-violet). More vibrant red dahlia varieties include "Creve Coeur," "Taratahi Ruby." "Preston Park," "Zorro," "Kenora Wildfire," "Bishop of Llandaff" and "Danum Meteor." Cerise or magenta flowers can be seen on "Moray Susan," "Formby Perfection" and "Urchin." Here is a broad category. Pale pastels to clear, medium pink and rose to rosy violet can all be loosely grouped into "pink." In different light intensities, hints of white, lavender or red can combined to form various tints and hues of pink. Light pink dominates on "Hillcrest Kismet and "Kiwi Gloria," although the latter has hints of white and lavender. Mid-pink types include "Clearview David," "Snoho Doris," "Alloway Candy" and "Sir Alf Ramsey." Dark rose is found in the petals of "Vernon Rose," "Nepos," "Nenkazi" and "Gay Princess." Coral-salmon best describes "Kenora Lisa." Deep pink dahlia blossoms can look electric with violet or magenta pigmentation: "Lavender Athalie," "Mary Jomanda" or "Pink Jupiter." Warm, cheerful orange petals can be pastel-like sherbet or apricot/peach or intense like fire or "reddish orange". Examples of orange-blooming dahlias are "Hamari Gold," "Gateshead Festival" and "Ruskin Marigold." Some flowers may have yellow petals that are streaked with red to give an illusion of orange from a distance. Many light pink dahlia flower can assume a more lavender color in the dim light of early morning or at dusk, or merely when they are out of direct sunlight and in bright shade. 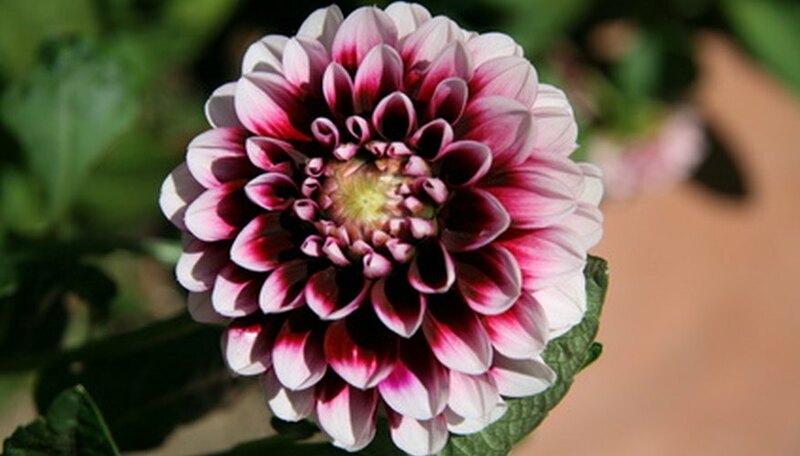 "Hallmark"
The American Dahlia Society places flowers with noticeable color variation on the same petal or flower head into categories like "variegated," "blends" or "bicolors." Many different color combinations exist, but do not involve blue, royal purple or black colors. Variegated flowers have specks, dots or streaks of a second or third color. Blend flowers are further broken down into "light," "flame" and "dark." Light blends involve pastel petal colors; flame blends involved red, orange and yellow; and dark blends display petals with dark red and purple/violet hues.